Mixed Greens with Berry Balsamic and Blue Cheese - A recipe from Savor California, the online showcase for extraordinary gourmet foods and beverages from California. Mix vinegars and mustard, then drizzle olive oil in while whisking until emulsified. Season with salt and pepper to taste. 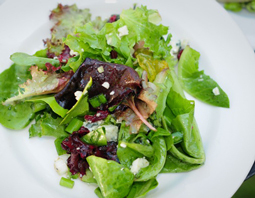 Toss greens with dressing and dried cranberries, top with crumbled Gorgonzola cheese.